The Sand in the City event celebration takes place in Arvada Colorado in June. 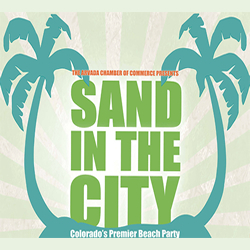 The Arvada Chamber of Commerce’s 4th annual Sand in the City Festival is Arvada’s signature event and Colorado’s premier beach party, expected to attract 13,000+ visitors from all over the Denver Metro area. New: There will be a $5/adult admission. Children 12 & under are FREE! A portion of all proceeds from Sand in the City will benefit the Jeffco Schools Foundation. The Kids Zone, featuring tons of fun and FREE activities for kids of all ages including two giant sandboxes with buried treasure, face painters, interactive games, make-n-take crafts area and much more! There will also be a variety of bouncy castles, inflatables, climbing walls and bungees available for a per-ticket cost. Peruse more than 70 local vendors offering ample shopping, food, and beverage choices Craft beer from local breweries, wine from Silver Vines Winery and beer spirits from Rado Distilling – all based in Arvada! Visiting? Discover great Deals for Arvada and more.